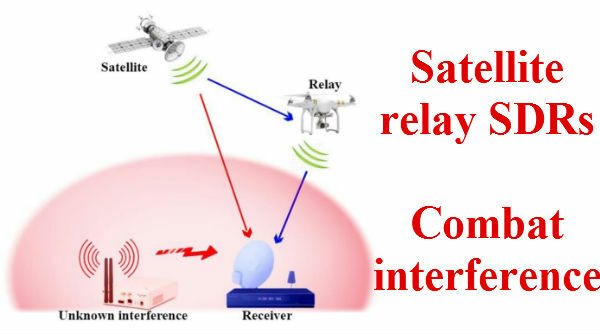 This paper discusses performance improvements of satellite links that suffer from terrestrial interference, where the improvements come from the ability to use a cognitive flying unit as a relay for the satellite-to-ground signal, to combat interference. The great majority of interference with satellite communications is unintentional, due to factors such as poorly trained operators, or adjacent frequency band congestion. However, intentional interference can be transmitted with a very inexpensive jammer, readily available commercially . In the case of downlinks, the attacker would not actually be interfering with the satellite but with the reception of satellite signals by terrestrial devices. Since satellite signal power at the terrestrial receiver front end low noise amplifier (LNA) is very weak, a small amount of interference can degrade performance and potentially deny service to the terrestrial terminal . Preferred solutions to this problem do not include modifications or reconfigurations to the ground station or satellite. Therefore, new entities such as unmanned aerial vehicles (UAVs) or drones can be used to assist in such corrupted links. As depicted in Fig. 1, this relaying entity should be located away from the terrestrial interference source, and its job is to forward the received satellite signals to the ground station receiver. The aim of this paper is to investigate example performance improvements of such proposed solution with SDRs in a real experiment. Fig. 1.Illustration of prototype experiment scenario. The main contributions of this paper are as follows: 1) design of most parts of a real transmitter-relay-receiver combination through GNU Radio flow graphs and SDRs and achievement of performance close to theoretical; 2) demonstration of significant suppression of interference and improved ground station satellite signal quality; 3) example measured data for two relaying methods, which provides useful information for design decisions in cognitive relays. Our proposed hardware contains three SDRs, working as transmitter, relay, and receiver. As Fig. 2 shows, for our initial experiments we connected these units with cables and used the flexibility of the SDRs to simulate all links with appropriately scaled values of signal power. Fig. 2.Overall laboratory system layout. In order to obtain realistic satellite link parameters we chose an example satellite for link budget calculations: the Intelsat 9 satellite at 317°E orbiting in perigee at 35,783.2 km and at apogee at 35,805.2 km. This satellite works on both C and Ku bands with 24 transponders of bandwidth 36 MHz (services include 160 voice, video, data, and internet channels to the Americas, Caribbean and Europe). We chose a frequency close to C-band, specifically 4.5 GHz, and modulation scheme of DQPSK. In satellite communication systems, the ground station antenna connects to a LNA, usually followed by a Low Noise (frequency down-) Converter (LNC), the combination referred to as an LNB. A typical LNA may supply a power gain of 20 dB. Considering these numbers, we emulate signal powers in our testbed to approach a real case study while allowing a margin for LNA amplification. Flexible modern radios that are reprogrammable or reconfigurable are known as Software Defined Radios (SDR). 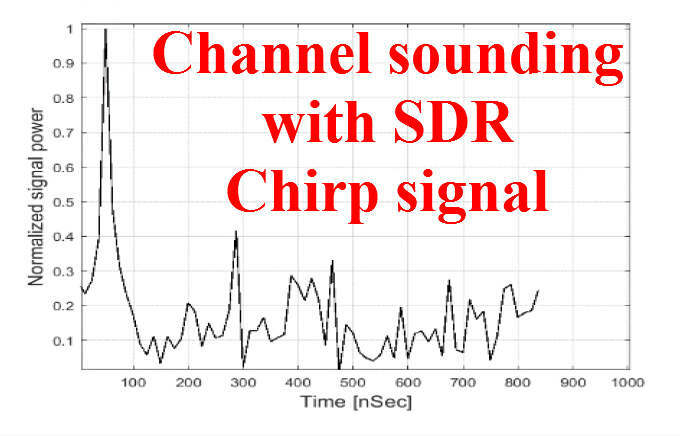 The Universal Software Radio Peripheral (USRP) is one of the well-known SDRs in the market. The model we used in this experiment is the National Instruments B210. Although the USRP is a flexible SDR, it has a throughput limitation. This device should have a maximum instantaneous real-time bandwidth of 56 MHz, but our measurements and some user reports indicate approximately 7 MHz of I/Q data with USB2.0, and slightly more with USB3.0. This might limit us in standards such as 802.11b (with 20 MHz channels) , but in this experiment we show performance with lower sampling rates simply to illustrate concepts. Due to space limitations we cannot provide descriptions of the GNU Radio software, packet formatting, and physical and data link layer processing. Interested readers may contact the authors for additional information. An example signal spectrum at the output of the first SDR, working as an emulated satellite transmitter, is shown in Fig. 3. This pertains to differentially-encoded QPSK modulation with a root-raised cosine filter with roll off factor of 0.35 . The symbol rate is 125 ksps. The signal constellations are shown in Fig. 4. Fig. 3.Signal spectrum at satellite transmitter. Fig. 4.Signal constellations for transmitter and receiver. In the receiver we use a designed flow graph for timing and phase recovery algorithms, distortion correction, and demodulation . A post processing step extracts the packets using a predefined preamble for detection and BER measurements. The DF relay can demodulate the received signal, decode, re-encode and re-modulate it, and then transmit to the destination. The advantage of DF is that by decoding, the relay can essentially eliminate the noise of the re-transmitted signal. In contrast, AF relays amplify the received signal and retransmit it to the destination without any further processing (no demodulation or decoding). For this reason, AF has less complexity than DF relays. In the relay segment, we designed two flow graphs for both AF and DF techniques and implemented them in our SDR. See Fig. 5 for design flow details. Fig. 5.Overview of aggregate relay flow graph. In this paper, we employed a narrowband (pure sinusoidal) interferer from a jammer that is located close to the ground satellite antenna. Since satellite antennas are directional, we simulate a low power interference received through the ground station antenna sidelobes. Fig. 6 depicts the received spectrum including the desired signal plus the interference. As Fig. 7 shows, the received spectrum at the receiver consists of three signals: first, the signal coming from the relay which is the “clean” and re-transmitted satellite signal; second is the weaker signal coming directly from the satellite, and third, is the sinusoidal jamming signal which appears as a spectral line in the frequency domain. Fig. 6.Receiver spectrum after jamming. Fig. 7.Receiver spectrum after relaying. As is well known, digital link performance depends upon the ratio of carrier power to noise power at the receiver input, conventionally denoted as C/N (or CNR). Our link-budget calculations are used to determine this ratio. From the USRPB210 datasheet , our maximum output power in transmitting mode is 20 dBm. We gradually increase signal power and measure BER and packet success rate.Fig. 8 shows a BER versus CNR plot for the direct link only. As we can see, the performance follows the theoretical curve with less than 1 dB of implementation loss at higher CNRs down to BERs of 10-6. Figures 9 and 10 show results in the presence of interference, with the two different relaying modes. The carrier to interference ratio is 6.62 dB. As can be seen from Fig. 9, the use of a relay can substantially improve performance, especially for the DF technique. As Fig. 10 shows, the AF technique is advantageous at very low CNRs although many receivers will not operate at this low CNR. As noted, the calculated CNR for our assumed configuration was approximately 9.41dB. From both Figures 9 and 10 this would imply a preference for DF over AF. Yet in different applications, since CNR can change significantly, the relay could decide on the method based on CNR, packet delivery rate, delay and hardware processing capability. Fig. 8.BER vs. CNR for direct (unjammed) link. Fig. 9.BER vs. CNR for all links. Fig. 10.Packet success rate vs. CNR for AF and DF relaying methods. In this paper, we have presented results from a customized testbed using USRP devices and implementing the GNU Radio software platform for a simulated satellite link in the presence of interference. We imposed a tone interference signal on the emulated satellite link and quantified the BER performance degradation. Then via a satellite relay link we illustrated significant performance improvements in the presence of the interference. The AF relaying method performs worse than the DF relaying, as expected, since the AF approach amplifies noise in an already weak signal. Another interesting performance measure is packet loss, and we found that for the lowest range of CNRs, AF outperformed DF. For future work, we plan to vary the range of signal to interference ratios, use different encoding and decoding methods and employ broadband interferers of various types, and eventually configure small UAVs to conduct proof-of-concept experiments for our satellite signal relaying schemes. L. Grego, "A history of anti-satellite programs," Union of Concerned Scientists,http://www.ucsusa.org/sites/default/files/legacy/assets/documents/nwgs/a-history-of-ASAT-programs_lo-res.pdf, 2012. C. Chang, "DSN Telecommunications Link Design Handbook." DSN Document No. 810–005, Rev. E (2015): 373, 2015. D. Roddy, Satellite Communications, McGraw-Hill, 2006. G. Cuypers, “Noise in satellite links,” Belgian Microwave roundtable, 2001. H. Yu, “Performance of cooperative relaying systems with co-channel interference,” Doctoral dissertation, Georgia Institute of Technology, Atlanta, GA, 2012. M. Brown, "Guided Tutorial PSK Demodulation," GNU Radio, 8 Mar. 2017,https://wiki.gnuradio.org/index.php/Guided_Tutorial_PSK_Demodulation, 12 Apr. 2017. 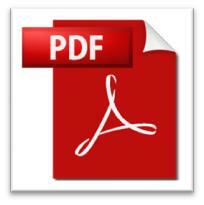 National Instruments, “DEVICE SPECIFICATIONS NI USRP-2901” datasheet, August 2015.